Sometimes people give me things... and when they do I try them. Sometimes I don't love them, but sometimes, as is the case here, I become COMPLETELY and totally obsessed. Now, I am 30. Having not had much acne in my teens I thought I dodged a bullet... But alas. It was not to be. Much to my chagrin, my skin is still not "oily", no no, that would be too easy. 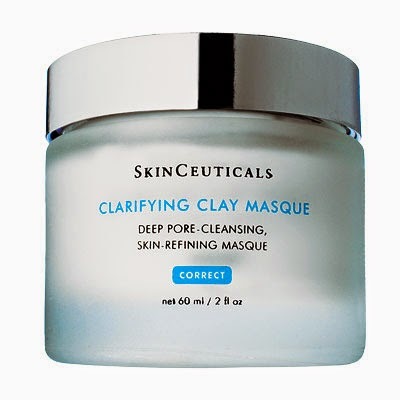 Instead it is dry and sensitive AND about once a month (ahem, hormones, ahem) I am plagued with an eruption of spots ranging from deep, painful cystic acne to tiny, innocuous but make-up defying whiteheads. When this happens, I do this mask... And the next morning I wake up with skin that is clearer, soothed, and not overly dry like some other masks or acne treatments can leave me. If you've got dry, sensitive, acne-prone skin like this girl, you need to try this mask. And at about $40 it may be the cheapest thing Skinceuticals makes. Bonus Tip: I will also use this to spot treat the occasional bad boy by putting it on at night right before bed and sleeping with it on overnight. My man is blind as a bat without his glasses and has yet to notice.